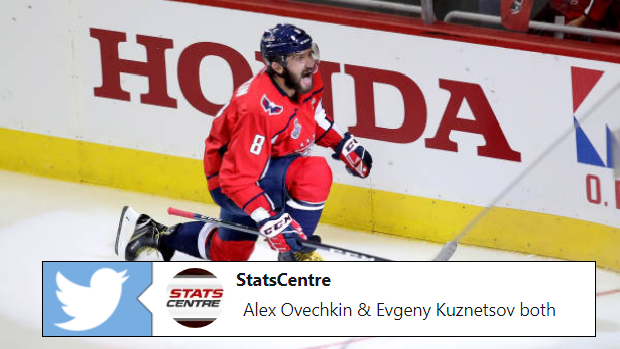 Alex Ovechkin and Evgeny Kuznetsov have been on a mission together during the 2018 postseason. Historically it’s been Nicklas Backstrom who’s played the role as Ovi’s right-hand man, but it’s been Kuznetsov wh's been doing damage alongside his fellow Russian superstar. Kuznetsov appeared to be injured after taking a hit from Vegas Golden Knights defenceman Brayden McNabb to the upper body in Game 2, but he was able to fight through the pain and contribute for the Caps big in the next game. He and Ovechkin scored, catapulting them into an exclusive club with Sidney Crosby and Evgeni Malkin (among others) to each record 12 + goals in a single playoffs over the past 25 years.. Scoring has never been an issue for either player, especially Ovechkin. The issue was that the team could rarely make it over the hump and ironically enough, get past Crosby and Malkin in spring hockey. But after defeating the Pens in six games in the second round, both players have now played a career-high 22 games. Ovechkin’s 14 goals ties him with Winnipeg Jets forward Mark Scheifele for the playoff lead. If the Caps can win, it’s a shame that the Conn Smythe Trophy won’t be split between two separate players. Both have simply been remarkable during the postseason and could easily each be named the MVP. When you throw goaltender Braden Holtby into the mix, the NHL could be in for a tough, tough decision.